What Day Of The Week Is August 5? 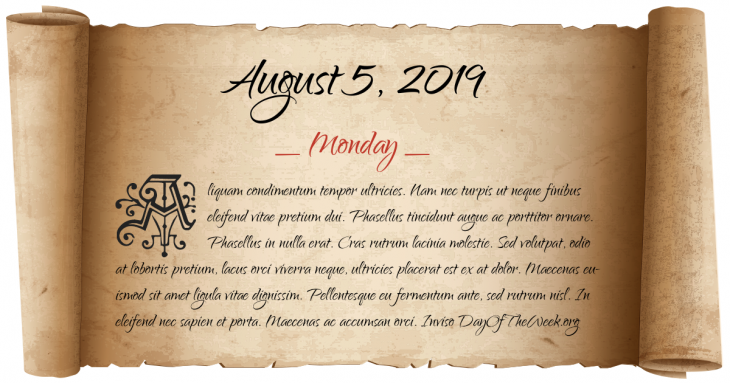 August 5, 2019 is the 217th day of the year 2019 in the Gregorian calendar. There are 148 days remaining until the end of the year. The day of the week is Monday. William Wallace, who led the Scottish resistance against England, is captured by the English near Glasgow and transported to London where he is put on trial and executed. The Battle of Otterburn, a border skirmish between the Scottish and the English in Northern England, is fought near Otterburn. American Civil War: Battle of Baton Rouge – along the Mississippi River near Baton Rouge, Louisiana, Confederate troops drive Union forces back into the city. Vietnam War: the U.S. Congress places a $1 billion dollar limit on military aid to South Vietnam. Who were born on August 5?